2017 Tanja Liedtke Fellowship winner – Lauren Langlois. Lauren Langlois reflects on her Tanja Liedtke Fellowship in Berlin. 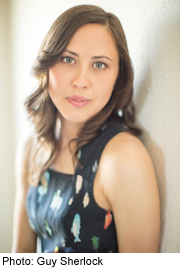 Our fifth Tanja Liedtke Fellow, Lauren Langlois conducted her Fellowship program in August. Below are her reflections on the experience. “The Tanja Liedtke Fellowship has facilitated a pivotal chapter in realising my own creative and choreographic interests. The first stage development for Twenty Forty Six consisted of a series of explorative writing, theatrical and physical tasks to form an elaborate movement language and story-driven world. Like most creative processes, I encountered both astonishing moments of inspiration, and disheartening moments of frustration. I have always had an affinity with process, and revelled in those moments where a kernel of an idea would develop into something surprisingly unexpected. I would walk home feeling dejected some days, only to wake up feeling elated the next. These stages and opportunities for growth were what made this experience transformative for me. The opportunity to show our 17 minute piece at Nah Dran was an unexpected blessing as it provided a timeframe in which to formulate all we had researched and worked on over the previous three weeks. I decided I wanted to develop a constructed piece of work within the frame of a beginning, middle and ending. In hindsight I realised I could have presented a series of separate choreographic ideas and this would have been fine. However, this pressure to present something whole, resulted in a cohesive performance and a clear idea for a new work which I would love to explore further. I am grateful to the Foundation for this opportunity, and to my collaborators James, Nicola and Chimene for their hard work, boundless energy and commitment to this development. This Fellowship has provided an opportunity for me to explore and unearth the foundations of a new work and I look forward to the next opportunity to delve further into my own choreographic practice”. TLF is very pleased to see Lauren’s hard work come to fruition. We wish her all the very best for the next developments. The Tanja Liedtke Foundation is very pleased to announce that Lauren Langlois is the winner of the 2017 Tanja Liedtke Fellowship. This year marks the fifth Tanja Liedtke Fellowship, with previous winners being some of Australia’s most exciting contemporary choreographers. Langlois was chosen by the Foundation’s Board of Trustees from an exceptional field of candidates. Langlois will spend four weeks in Berlin in August of this year. The first three weeks will be in residence at adaStudio in Berlin, developing the first stage of new dance theatre work that explores a future world through some very specific scenarios and possibilities. Belgium based Australian dancer James Vu Anh Pham and actor/writer James Mackay will join Lauren in the development which will conclude with a public showing. The Fellowship program coincides with Berlin’s international contemporary dance festival Tanz im August, so Langlois will be able to spend one extra week in Berlin to see performances, engage in workshops and generally ‘mix it up’ with the amazing Berlin scene. “I am honoured and delighted to be the recipient of the 2017 Tanja Liedtke Fellowship, and grateful for this opportunity to explore the beginnings of my own creative practice surrounded by the cultural vitality of Berlin” said Langlois. “I have always harboured the aspiration to create work and I am truly humbled that through this prestigious Fellowship, it will be the Tanja Liedtke Foundation’s support that will propel me into taking this first step. I am excited at the possibilities of what might be achieved in exploring the seed of a new work in such an invigorating environment. I wholeheartedly thank the Foundation’s Board of Trustees for their support, and for giving me the opportunity to begin this journey”. The biannual Fellowship was initiated to honour the remarkable dancer and choreographer Tanja Liedtke who at the time of her tragic death in a road accident was the Artistic Director designate for the Sydney Dance Company. It is now 10 years since the arts community lost Tanja Liedtke - one of the dance world’s brightest stars. Not only was Liedtke an exceptionally talented choreographer and performer, she managed to inspire many of her fellow artists. The Fellowship shines a light on Tanja’s legacy – her sense of adventure, her art, her courage and her total commitment to use art (dance and theatre) as a way to talk to people – to give them something to work on, to make people think and make them question. Lauren Langlois in 'Complexity of Belonging’, Chunky Move. Photo: Jeff Busby.